A rash of mid-flight kidnappings threaten a project Diana is putting together to aid the less fortunate areas of Africa, and MO points to the Sky Band, a group of air pirates the Phantom has tangled with before, including the leader, Sala, who fell in love with the Phantom. A plan is set up where Diana replaces one of the visitors, an old friend, and sure enough the plane is attacked. The Phantom is overwhelmed, but the new leader doesn’t yet want to kill him…but she is calling him “daddy”. What they got right: One thing I’m enjoying about Raab’s run is the use of characters from the comic strip. The last issue involved Diana’s cousin and now we have a new version of an old foe from the comics. The art is good. I like the design of the flying suits the Sky Band uses. What they got wrong: But now they’ve gone from sky pirates to environmental, anti-corporate activists. I don’t know if that works for me. Other notes: At this point I have caught up with the issues I already reviewed before my big sorting project. That means if you want to see how this story ends I’ve already reviewed the conclusion. Next week I’ll resume where I left off. I still maintain that #8 was the first issue I picked up so I must have gotten the rest in back issue. Recommendation: Now that I’ve read both issues this is a good story and worth checking out. 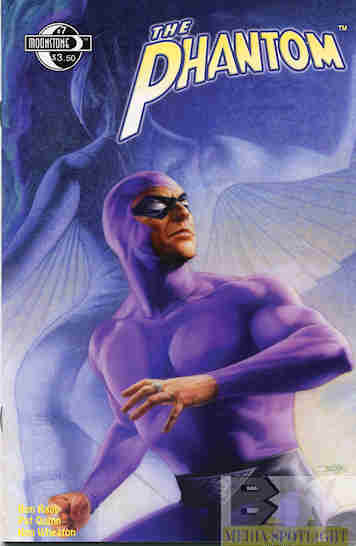 Posted by ShadowWing Tronix on April 6, 2018 in Yesterday's Comics and tagged Diana Palmer-Walker, Moonstone Books, The Phantom, The Sky Band.